2. Why Nanotechnology and Nanomedicine? 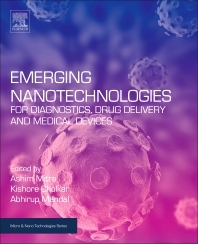 Emerging Nanotechnologies for Diagnostics, Drug Delivery and Medical Devices covers the modern micro and nanotechnologies used for diagnosis, drug delivery, and theranostics using micro, nano, and implantable systems. In-depth coverage of all aspects of disease treatment is included. In addition, the book covers cutting-edge research and technology that will help readers gain knowledge of novel approaches and their applications to improve drug/agent specificity for diagnosis and efficient disease treatment. It is a comprehensive guide for medical specialists, the pharmaceutical-industry, and academic researchers discussing the impact of nanotechnology on diagnosis, drug delivery, and theranostics. Ashim K. Mitra is Professor and Chair of Pharmaceutical Sciences at the University of Missouri-Kansas City, USA. He was named one of two recipients for the 2007 ARVO/Pfizer Ophthalmics Translational Research Award He is the Vice Provost for Interdisciplinary Research for the University of Missouri-Kansas City, and Director of Translational Research at UMKC School of Medicine. He is also the University of Missouri Curators’ Professor of Pharmacy and UMKC’s Chairman of Pharmaceutical Sciences He is the author and coauthor over 250 research articles, book chapters and review papers. Dr Mitra is the recipient of a number of research awards from the National Institutes of Health, the American Association of Pharmaceutical Scientists, the American Association of Colleges of Pharmacy and numerous pharmaceutical organizations He is the 1999 recipient of the University Trustee’s Faculty Research award from the University of Missouri and 1992 recipient of National Collegiate Inventor of the Year Award from the National Invention Center and the BF Goodrich Corporation He has served as the editor of Ophthalmic Drug Delivery Systems (CRC Press) ,which is currently in its second edition and coeditor of Advanced Drug Delivery Reviews (Wiley). Kishore Cholkar is a PhD candidate at the University of Missouri research assistant to Prof. Mitra.